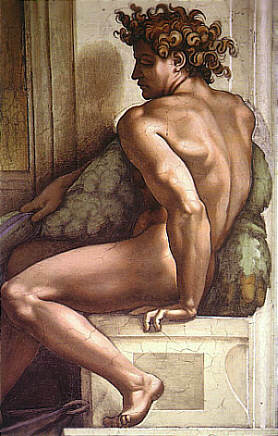 In 1508 Michelangelo returned to Rome. 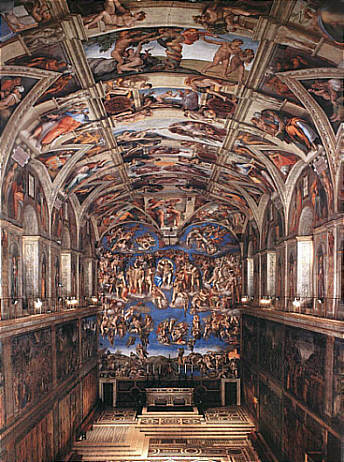 And here Julius had the most biggest commission for him: the painting of the ceiling of the Sistine Chapel. He started the work on the 10th of May. He was then 33 years old. Nobody knows how much he had refused to realize this work of art. He considered himself a sculptor, not a painter (especially not a fresco painter although he had been taught by Ghirlandaio) and was convinced he would never be good enough. He even suggested Raphael who had proved his skill in painting already, but nothing helped. He had to obey and start his work. The chapel was built between 1475 and 1483, in the time of Pope Sixtus IV della Rovere. A basic feature of the chapel itself, so obvious that it is sometimes ignored, is the papal function, as the pope's chapel and the location of the elections of new popes. Furthermore, the building was in some respects a personal monument to the Della Rovere family, since Sixtus IV saw to its actual construction and the frescoes beneath the vaults, and his nephew Julius II commissioned the ceiling decoration. Oak leaves and acorns abound, heraldic symbols of the family whose name means literally "from the oak." The Chapel is rectangular in shape and measures 40,93 meters long by 13,41 meters wide, i.e. the exact dimensions of the Temple of Solomon, as given in the Old Testament. It is 20,70 meters high and is surmounted by a shallow barrel vault with six tall windows cut into the long sides, forming a series of pendentives between them. A marble mosaic floor of exquisite workmanship describes the processional itinerary up to and beyond the marble screen, to the innermost space, where it offers a surround for the papal throne and the cardinals' seats. The architectural plans were made by Baccio Pontelli and the construction was supervised by Giovanino de'Dolci. The walls are divided into three orders by horizontal cornices; according to the decorative program, the lower of the three orders was to be painted with fictive "tapestries," the central one with two facing cycles - one relating the life of Moses (left wall) and the other the Life of Christ (right wall), starting from the end wall, where the altar fresco, painted by Perugino, depicted the Virgin of the Assumption, to whom the chapel was dedicated. The upper order is endowed with pilasters that support the pendentives of the vault. Above the upper cornice are situated the lunettes. Between each window below the lunettes, in fictive niches, run images of the first popes - from Peter to Marcellus - who practised their ministry in times of great persecution and were martyred. The wall paintings were executed by Pietro Perugino, Sandro Botticelli, Domenico Ghirlandaio, Cosimo Rosselli, Luca Signorelli and their respective workshops, which included Pinturicchio, Piero di Cosimo and Bartolomeo della Gatta. The ceiling was frescoed by Piero Matteo d'Amelia with a star-spangled sky. This was how Michelangelo found the chapel. He looked up to the stars: could he be able to paint this ceiling? And what would it be? Which theme? Religious of course, this was the papal chapel after all and used for the conclave when a new pope was chosen. We don't know how Michelangelo found his theme eventually nor what was going on in his mind when he created just the mere division of the room, which seemed very difficult. Almost impossible since the ceiling was a vault. The result is breathtaking. And he thought he couldn't paint? Which genius had guided his hand? Let us hear Rolland again: "The gigantic task starts. Gloomy years - the gloomiest and most magnificent of his entire life. That's the legendary Michelangelo, the hero of the Sistine Chapel.... He suffered terrible. He had hardly finished "The Deluge" when the whole thing started to go mouldy." A friend of his gave him tips referring the humidity in the Sistine and so he had to strike off parts of the fresh made freschi and start new. He invented a special construction site that he had set up in the middle of the room. He could move it to the place he needed. 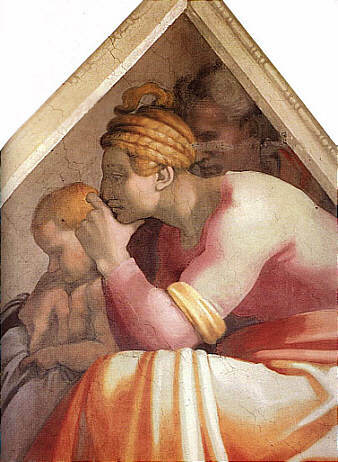 In planning the architectural design Michelangelo first had to accommodate his program to the pre-existing building, including the windows, which were the source of light for his decoration. The wreath of openings still provides the principal viewing light. Michelangelo devised a long central area framed by a fictive marble cornice and separated into nine sections by broad pilaster strips bent across the ceiling, also in imitation white marble. Sections of alternating dimensions are framed between wider and narrower bands. 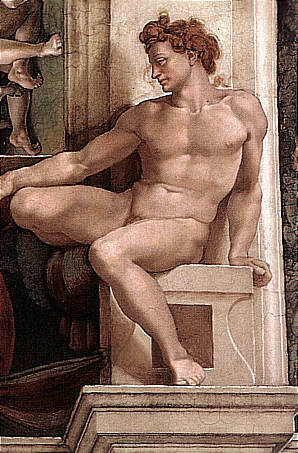 Within them Michelangelo varied the size of the actual narratives, giving only the smaller ones a marble frame. Four ignudi (male nudes), among the most admired elements of the ceiling, ostensibly support ribbons attached to large medallions painted to look like bronze. Twenty in all, they are in different poses, producing, together with the Prophets and Sibyls, a "handbook" of alternatives for the seated figure for later artists. At the corners of the ceiling Michelangelo has painted four salvation subjects, including David and Goliath and Judith and Holofernes. Triangular-shaped compartments are repeated in a continuous band along the entire border of the ceiling; they contain bronze-coloured nudes that alternate with the renowned Prophets and Sibyls set into marble thrones which, in turn, have paired marble putti in a variety of poses and positions that expand upon the tradition of Donatello and Luca della Robbia. The ancestors of Christ are painted on the flat side walls, the only section of the decoration that did not require the visual adjustments posed by painting on a curved surface. In the scheme of divisions, the key elements are the thrones of the seers flanked by plinths and colonnettes decorated with pairs of putti supporting the cornice running above the crowns of the spandrels, at about a third of the way across the curve of the vault. Beyond the cornice, the vertical frames flanking the thrones are prolonged as the arches crossing the vault. They divide it into nine compartments in which the stories of Genesis - from the Separation of Light from Darkness to the Drunkenness of Noah - are represented as if they were seen above the space of the chapel, beyond and through the imposing structure of the painted architecture. In the five compartments above the thrones, the field of the narrative scenes is limited in size by the presence of four figures of ignudi, sitting on plinths and bearing garlands of oak leaves and acorns, and of two medallions painted to resemble bronze, with episodes drawn from the books of Genesis, Samuel, Kings, and Maccabees. Lastly, under the cornice and the thrones, in the spandrels and the lunettes at the tops of the walls, are depicted the forty generations of the Ancestors of Christ, from Abraham to Joseph, while the corner pendentives contain representations of biblical scenes associated with the theme of the divine protection of the Jews: Judith and Holofernes, David and Goliath, the Brazen Serpent, and the Punishment of Haman. His family lived off him. His father never stopped whining, his three brothers exploited him. 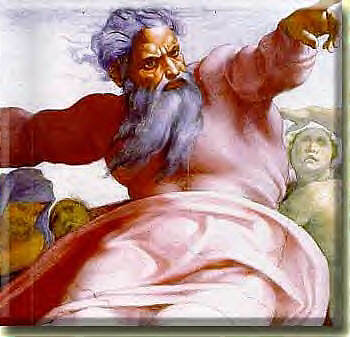 The pope was getting angry about his slowness and the stubbornness with which Michelangelo hides his work. The proud characters clashed with each other like thunder clouds. Condivi, his contemporary biographer wrote: "1510 Michelangelo wanted to be at home for the Day of St. John and asked the pope for money and as he asked when the chapel would be finished, Michelangelo answered like usually: "when it's time". The hot-tempered pope hit him with his pole and repeated outraged: "When it's time! when it's time!" Michelangelo rushed home and started to return to Florence when a young friend of his arrived - Accursio - sent by the pope to bring him 500 Ducats. He soothed Michelangelo and apologised on the pope's behalf. Michelangelo accepted." It must had been a terribly hard work, Michelangelo described it in some of his poems where he was laying on his back, painting over his head, the paint dripping into hair, beard and eyes. Long after the work was finished he had problems in looking straight. Once he fell from the construction side several meters high and hurt his leg. But since he never undressed neither his clothes nor his boots, nobody could look and see what happened with his leg. Michelangelo didn't care anyway. Julius, feeling his end nearing, wasn't tired to hurry the artist until he said one day: "You fancy I'd throw you from this construction?" So Michelangelo had to give in, removed the site and unveiled the work. It was the 31st of October in 1512, Halloween, so to say. This ceiling was considered over centuries as the unrivalled highlight of painting. The artist himself though doubted its qualities. It's the adolescent face of Adam that draws our most attention, seen in profile, still lacking a definite expression, contrasting with the mature, intensely energetic one of the Lord, with his grey hair and long beard streaming in the air. Their outstretched fingers never meet, but it seems as if some energetic spirit would flow from God's finger tip. 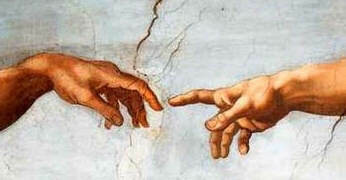 This is the span, "the two centimetres that parts us from God" as Michelangelo interpreted it. On the side walls of the chapel, five prophets alternate with the same number of sibyls, so that each prophet is paired with a sibyl on the opposite wall: the Delphic Sibyl and Joel, Isaiah, and the Erythraean Sibyl, the Cumaean Sibyl and Ezekiel, Daniel and the Persian Sibyl, the Libyan Sibyl, and Jeremiah [further prophets are Zechariah and Jonah]. This studied parallelism alludes both to the theme of the universality of the message of Redemption and the idea of the perfect concordance of the Revelation in the Judaic world and in the pagan one. As part of the decorative scheme of the ceiling, above each of the thrones of the sibyls and prophets (except Zechariah and Jonah) are two figures of ignudi, sitting on plinths and bearing garlands of oak leaves and acorns, and of medallions painted to resemble bronze, with episodes drawn from the books of Genesis, Samuel, Kings, and Maccabees. Although it is within the painted architectural structure, their prominent position - contiguous to the nine prophetic visions - means that they cannot be considered as ornamental elements, and suggests that their function is more than the merely heraldic one attributed to them by Vasari. They seem rather to have been conceived as angelic figures in the special acceptation of "intermediary spirits between men and the Godhead" suggested by Charles de Tolnay. "Libyca: arrogant with a stocky neck; Persica: short-sighted and feverish; Cumaea: old one and with tremendous arms and hanging heavy breasts; beautiful Eritrea: strong, calm, and ironic; Delphica: the virgin with the beautiful body and the incredible eyes. Daniel: with thin lips, glassy eyes, tousled hair; Jesajas: bitter and contemptuous; Joel: the wise one with his modern, attentive and serene face who studies a text. Ezechiel, the impetuous who is at odds with himself, and with a genius of an obscure beauty who seems to show him the one, who is supposed to arrive. Jeremias, who has sunk into unimaginable silence; and the gasping Jonas, who has been spat out of death's mouth: all these tragic beacons of thinking, who are consuming themselves in the night of the pagan and Jewish world; the total wisdom of humanity waiting for the Redeemer. Over the 12 windows there are the heralds and the ancestors of Christ who are dreaming in the middle of the storm. The night is long and full of nightmares. They try to sleep, they try to pretend that they were waiting; pondering, worried, dejected, they remain silent. Only the mother of Jesse, who is sitting there, dares to look at the threatening future, the image of the one, who is to come forth from her: I read in her fixed, open eyes the secret ideas, encumbering all these beings, which they do not dare to admit: the fear. In the four corners of the vault, the incredible happenings are represented, which saved the chosen people of God: David kills Goliath. Judith carries away the head of Holofernes. The Hebrew writhe from Moses' serpent's bites. The crucifying of Haman. Untamed ideas of murderous fanaticism. Terror, sadness, waiting. We, who know, how Michelangelo completed thirty years later the cycle of his thoughts with The Last Judgement, we know who they are waiting for: the image of Christ hurling bolts of lightning."